Unsmoke/ProRestore A highly-concentrated general purpose odor counteractant. 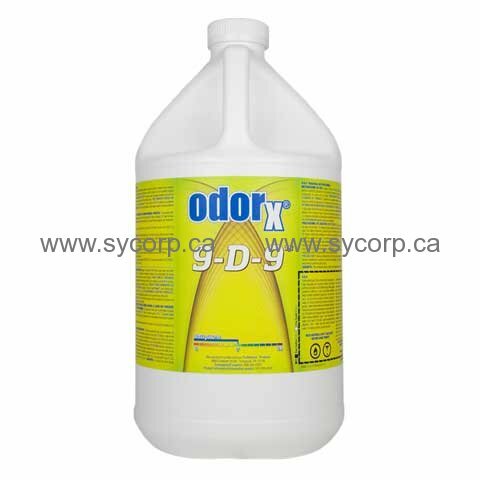 9-D-9 is a general purpose smoke odor counteractant specially formulated to manage fire, smoke and other strong odors. Blended with the finest-quality ingredients, 9-D-9 helps to detoxify and knock down malodors fast and efficiently. Apply 9-D-9 with a compression sprayer or an airless paint sprayer only. Do not use with a fogger. Preparing RTU solution: Add 3 ounces of 9-D-9 with enough water to make one gallon of ready-to-use solution (23 mL / L). Saturation spray smoke residue deposits. Detoxifying smoke- and fire-damaged job sites: Treating smoke-damaged surfaces and charred materials with 9-D-9 solution inhibits the evaporation of toxic fire-related vapors. For charred wood or additional odor control: Add 1 ounce of Last Resort™ to each gallon of 9-D-9 solution as prepared above (8 mL / L). Use with other products: 9-D-9 may be added to other water-based cleaning solutions to increase their effectiveness. For best results use 9-D-9 as part of the three step odor removal system. For complete instructions and safety data for this product, refer to the Use Guide and Material Safety Data Sheet, available under the Documents tab.